An antique silver glass finish table lamp complete with a taupe pleated tapered lampshade. A metallic finish on any table lamp will always reflect a wonderful bright light reflecting against the colour from the base, The Elizabeth table lamp will throw a wonderful haze and create a rich warm glow when illuminated. 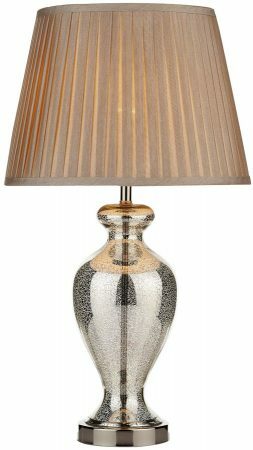 Topped with a pleated faux silk taupe lampshade.